Is there any way to skip required fields validation when switching between tabs and perform it only on submit? Its what this post about. Isnt it? I meant: switch to the second tab without entering required values in the firs tab :). This is what I describe in this post: "Because of Immediate = true - we can open second tab without getting validation errors"
3) Both Contact and Details showDetailItem have Immediate property to false. 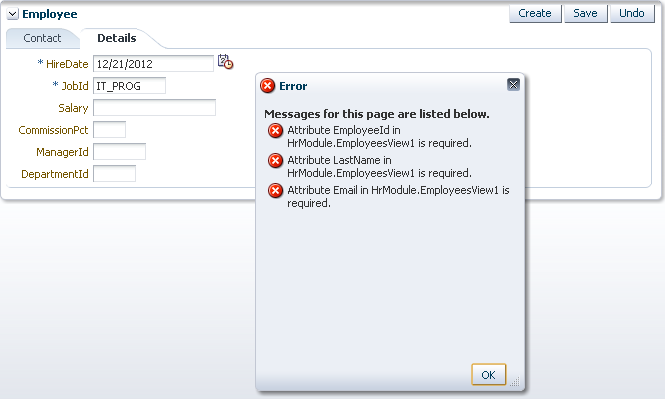 There is no need to change anything - skipValidation = true is already set on Employees fragment. 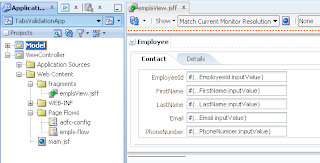 This sample was implemented with ADF 11g R2, which ADF version are you using? I'm trying to use this solution with a series of Show Detail Headers (these are populated by an iterator). When I add a row and try to disclose the (empty) contents, I'm getting validation errors; even after following the steps described. Should this solution work for these Show Detail Header elements as well? It should work, I would need to test it. I have added SkipValidation="true" to my pageDef page and also I added immediate="true" and also immediate="false" to af:showDetailItem,but both are not working.For both case,I can't go to select tabs. Can you please give idea? Does it work when you test with my sample app? I have a quite similar problem, but not exactly the same. I ve 2 tabs on each one there are required filed. The submit button is outsite the af:paneltabbed. Suppose I am on the first tab, I ve not inserted anything yet on the second one, I submit -> the required fileds of the second tab are escaped, no error message is displayed. How can I make the submit button controls the required fields of both tabs. Did you try to use skipValidation=true as this post describes? I have two tabs, one is having mandatory fields and the other showdetails tab is not having any mandatory fields. Now the problem is when I try to submit the form from the second tab without giving the mandatory attribute on the first tab, it gets submitted. I want to prevent this form submission by prompting some error message or something. Why we need skipValidations here, we dont' have any entitylevel validation. i have run this project with skip validations = false.not finding any difference. Can you please tell what impact it has. You should read blog more carefully. There are EO level validations - required attribute check. With skipValidation = false, it will report errors from other Tab, on Commit. Double check what I describe in the blog post. so what would be the preferred way of dealing with view level validation? 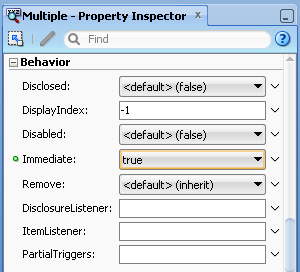 Say, if I would set the "required = true" on one of the attributes and try to change tabs without giving it any value? I have a case with rather complex form spread on multiple (nested) tabs and some of the fields become required depending on phase of some process. This is described in this post, set immediate=true for the tab and skipValidation=true in Page Def. Unless your case is different. Maybe I'm missing something then.. From how I understand your post "Immediate = true" will not solve described issue plus entered data is not stored on the Model. I figured out, that setting the top-most tab containing the required fields as immediate actually helps (errors on empty fields are not show on tab change but the values go to the model on save just fine) yet I'm not quite sure why.. According to the doc setting "immediate = true" on components that invoke disclosure events will only pull conversion, validation and event delivery up to the 'Apply Request Values' phase so required fields with no value should throw an error.. Yes, this is why you need to set additionally skipValidation=true, as I describe in the post. :) you got me confused, Andrejus.. In your post you are setting immediate back to false before setting "skipValidation = true". I, on the other hand, have "immediate = true" and "skipValidation = false" (I don't have any Model validation that needs skipping). Everything is working (almost) as should, I'm just trying to figure out why. This post described to leave immediate as default and set skipValidation=true. I don't know about your use case, but in this case it works - I can navigate across tabs, without firing validation messages on tab disclosing. To set immediate=true doesnt work well, as it will not submit values from the current tab, while moving to the next tab. 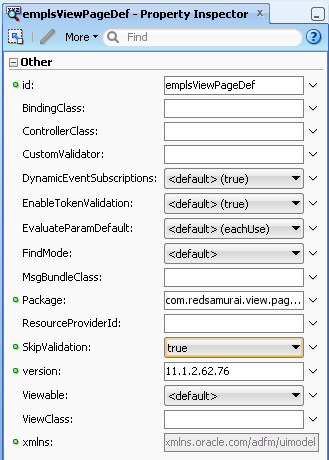 setting skipValidation = true on pageDef is still invoking validations on selectOneChoice fields. Am I missing something ? I think this should work fine, at least it works in our projects. But, I can double check. yes please, I tried setting skipValidation = true, also immediate = true. still the validation are getting triggered on value change instead of final form submit. I am facing this issue in editable table when columns are LOVs (selectOneChoice). Any pointer to resolve this issue would be appreciated.. 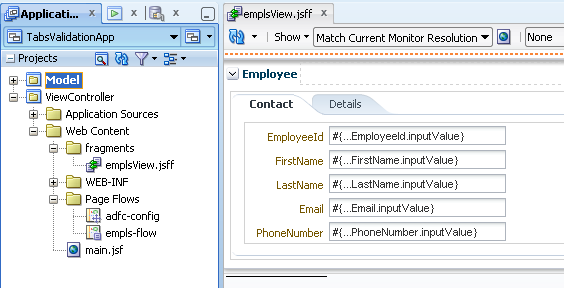 I have an form with Business Components (in with multiple fields such as inputFields, selectOneChoice and DatePicker. Some fields are marked "required=true", some are not. I have two use cases - validations work as I want those to on one, but not on the second case. 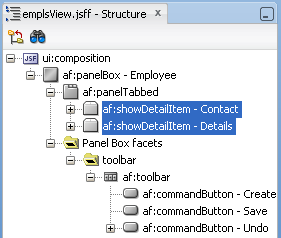 Use-Case 1: At the start, I click create and empty rows are created in the form. Then I click on a commandButton when the fields are empty and an error message pops up. This is expected behaviour. Use-Case 2: I enter a value in the textInput, then without clicking commandButton, remove the above entered value from the inputText and make it empty again. 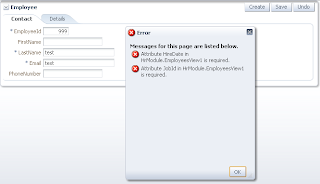 On change of focus from this field to another, ADF pops an error saying this is a required field. 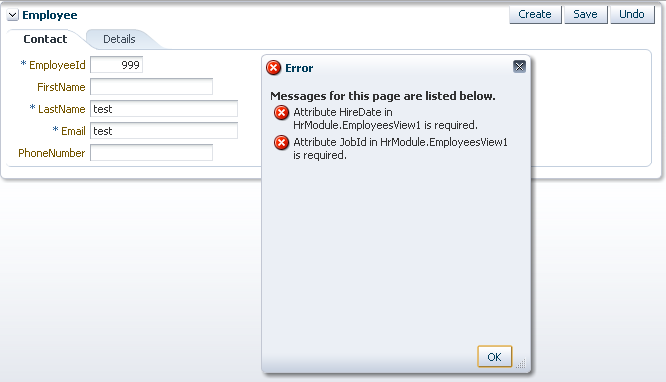 I want ADF to give this required field error on click of Submit and not on change of focus from field. "immediate=false" for all my input components, "required=true" for mandatory fields. I also have method reference to a validator method for these fields. "skipValidation" in the PageDef is set to false. I tried setting "skipValidation=true", but Case 2 is still not working as I want it to. Do you have any idea how can I make this work? Your guidance should certainly help. Andrejus thanks a lot for this post. I don't understand when we should use skipValidation. OK, in this case it works fine, but what is the rule to use it? what happens in respect to jsf lifecycle? I don't really understand what skipValidation does. Can someone point on a solution to this issue? I think this should work by default, when your fields are based on the same EO/VO. Hi Andrejus, thanks a lot for useful posts. do you have any suggestion for solving this problem? What you are trying to achieve is not supported. LOV list must contain only valid values. , that you said if we apply ExceptionMode = Immediate setting for Data Control Usage in DataBindings.cpx, then the error message is displayed. I just need to inform you that I downloaded your app and run it under JDeveloper 12.1.3, and 12.2.1 . Immediate is false as it should be, and skipValidation is set to true (you already preconfigured this all). But there is problem. In both versions I can't switch tabs. I will not asq why. I would like to asq however if there is something different in JDeveloper 12.1.3 and 12.2.1 considering skip validation? I simple can't find any explanation why your app is not working under this versions. Regards and thanks for great article. Thank you so much! You have no Idea how much this blog (and many more of your blogs) helped me out. This makes me happy, thanks. 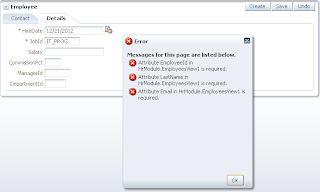 When i set skipValidation=true and i have a popup for my crud operation on my ADF 12c webapp, the validation msgs( shown programmatically) on IE 11 disappears for the first time. If i set skipValidation=false, then this disappearing of msg does not happen but we have the problem of required fields which your blog addresses. This thread posts the same question. I have Create jsff in CreateTF for E1, from the Create jsff i drilldown to Create jsff of another entity E2, after entring the required data on Saving the jsff it throws a validation error of required attribute from E1. I have studied your blog.I have a small requirement.I wnt to restrict user not to enter into another field untill he puts the value in first field.i wnt to show the user that this field is mandatory.. This helped me a lot and got a task done where the requirement is exactly the same as the post.